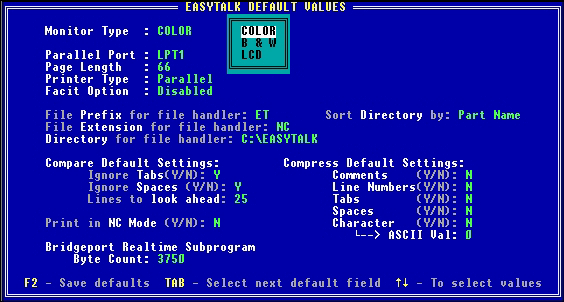 EasyTalk Shell™ provides a Windows™ wrapper around our legacy DOS based EasyTalk product. Designed and optimized specifically for CNC control applications, EasyTalk Shell continues to make communicating from a PC to a machine control almost effortless. Its RS232 communications capabilities support nearly every serial machine protocol in the market today. 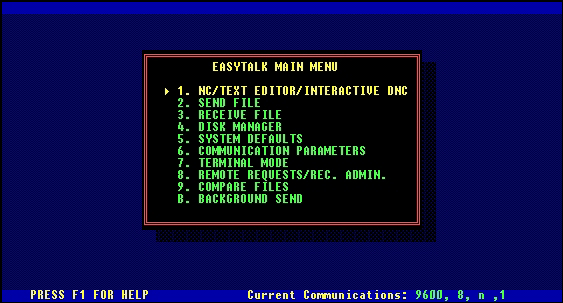 EasyTalk Shell makes communicating with a single machine control almost effortless. Simply match the machine control parameters, attach an RS232 cable and NC Program transfer becomes reality. 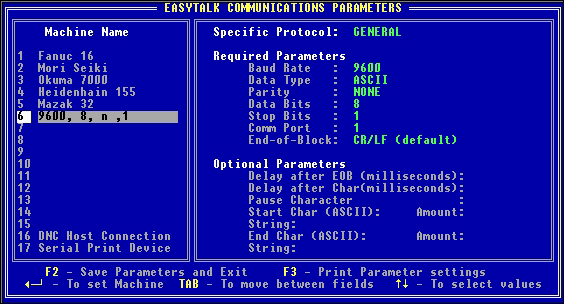 EasyTalk Shell supports standard serial communication protocols, as well as many special protocols such as Mazatrol, Heidenhain Blockwise, and Bridgeport DNC. INTERACTIVE DNC EasyTalk Shell’s interactive DNC capability lets operators see programs as they are being read into the machine control providing easy program look-ahead and file editing during program execution. This can be an invaluable and time saving tool during program prove-out. 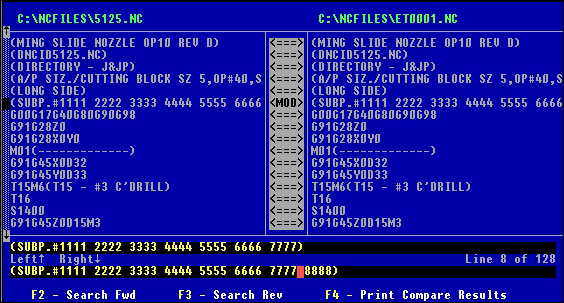 32 CHARACTER FILE MANAGEMENT EasyTalk Shell allows a 32-character file name to be assigned to NC programs, thus enabling part numbers and operation numbers (for example) to be displayed along with the DOS name of the file. The software also allows a 32 character customer or machine name to be designated to directories. 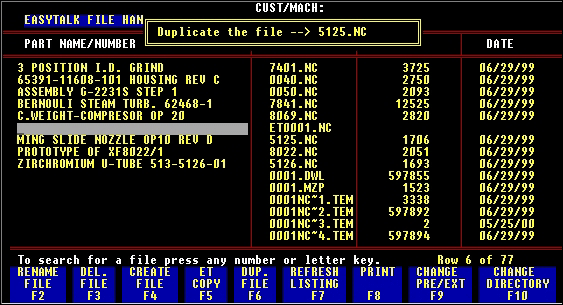 The directories can be sorted by either the 32 character name or the DOS name for convenient cross reference. 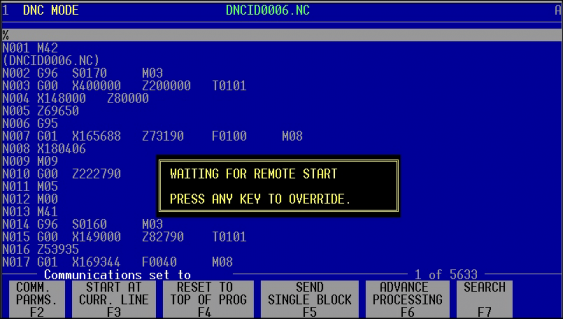 The 32 character name can even be created from an NC program comment line at the touch of a key. Functions for file copy, delete, duplicate and rename are also provided. FULL EDITOR AND FILE COMPARE UTILITIES EasyTalk Shell’s full screen editor for programs of unlimited size provides for fast and easy editing on the shop floor. All the standard word processing features like block copy, block move, block save and search & replace are included as well as the NC specific functions of scale, shift, renumber, strip numbers, and field reformat (decimal to/from leading or trailing zero). 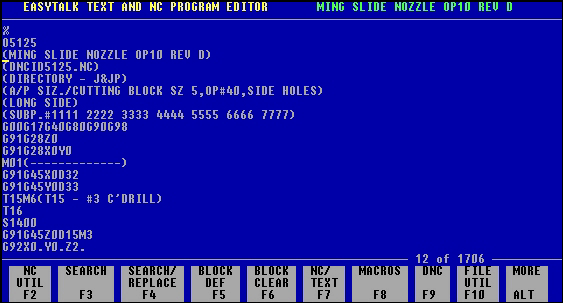 EasyTalk Shell’s side-by-side file comparison of two NC programs highlights modified lines and automatically adjusts for inserted and/or deleted lines. A printed report may be generated of only the differences or a complete side-by-side listing. Download our free 10-Day trial or purchase a full license for just $299.95 US. To download the installation program visit the ETShell Download Page.